Adding to the game's excellent ambiance is its soundtrack, which is absolutely sublime. The Souls series has always had excellent music, but Bloodborne sets a new standard in terms of how evocative the music is, and how harmonious it is with the world and gameplay. A few prime examples are the tracks "Micolash, Nightmare Host", and "Lullaby for Mergo". They're excellent pieces in their own right, but if you've not yet completed the game, I would recommend against listening to them out of context. Both are so perfectly unsettling and disconcerting; they're exact thematic matches for the scenes in which they're used. And then there's my favorite track, "The First Hunter," which is beautiful and melancholy, and paradoxically manages to create the perfect mood by being just so incongruous with its place in the game. Copyright 2015 From Software, Sony Computer Entertainment. Used under Fair Use. There's a lot to like about Bloodborne. Unfortunately, there are also a few respects in which I feel it falls short of the mark set by Dark Souls and Dark Souls II. First and foremost, the fact that it's exclusive to the PS4 is a huge disappointment. I should disclose, as always, that I work for Microsoft, so my opinion here is obviously colored by that. But console exclusives in general are bad for consumers; they force a choice between spending significant additional cash, or missing out on some of the best games the industry has to offer. Some people will never play Bloodborne simply because the monetary bar for entry is very high if the PS4 is not already their console of choice, and that's a shame. Perhaps of more concern to those players who already have a PS4, though, is that Bloodborne doesn't even run particularly well on the system. It looks great, to be sure, and the performance issues are by no means intolerable or game-breaking—but they're there. Some areas and graphical effects consistently cause serious stuttering; there are occasional hitches in the sound; and some textures and models are surprisingly low-definition for a game that should be a showcase for Sony's next-gen platform. Even worse, load times were absolutely atrocious when I first started playing, sometimes taking upwards of 40 seconds. The most punishing aspect of each death became not the potential loss of blood echoes (souls in Dark Souls parlance) or need to backtrack, but the tedium of having to sit through another 30-plus seconds of load screen. The load screens completely killed any sense of flow, and were a serious detriment to my overall enjoyment of the game. The inconvenience they cause is exacerbated by the fact that you can no longer heal at lanterns (bonfires) without traveling to the Hunter's Dream and incurring yet another load screen. Recent patches seemed to have reduced load times to more tolerable levels, but it could also be that I've just become used to the long load times. They're still longer than ideal, to say the least. In short, Bloodborne should have been available on PC. Despite From Software's initial reluctance to work with the platform and the shoddy port that Dark Souls received, the PC versions of Dark Souls and especially Dark Souls II were the definitive editions, with higher and more consistent framerates, support for multiple screen resolutions, and free online gameplay. The same could no doubt have been said of Bloodborne had it been released on PC, but alas, it looks like this one is bound to stay a Sony exclusive. As I mentioned previously, the world of Bloodborne is crafted with a level of care, imagination, and depth that most other games can't even approach. That said, I get the sense that the extra fidelity that the Sony's new platform allowed came at a cost in terms of environmental variety. This is disappointing, because exploring From Software's meticulously constructed and darkly beautiful worlds has always been one of my favorite aspects of the Souls series. Dark Souls had decaying, overgrown castles, moonlit forests, fantastic medieval cityscapes, caverns of shining crystals, fiery magma pits, poisonous swamps, and labyrinthine walkways and hovels spanning impossibly large chasms. Dark Souls II followed this up with a similarly impressive set of locales, especially if you count the DLC packages, all three of which were excellent. 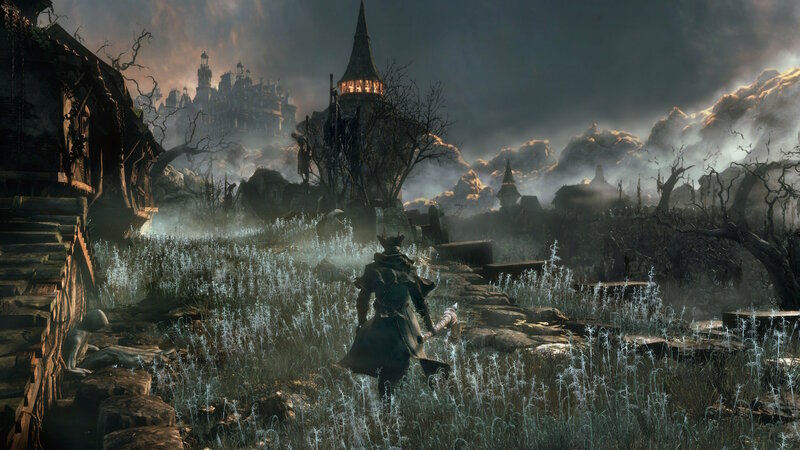 Bloodborne, by contrast, has only a handful of environment types. The vast majority of the game takes place in a twisted and gruesome caricature of Victorian England. There are maybe half a dozen other environments, and all of them are are extremely well imagined and rendered, but I found myself wishing for the more of the variety that the Souls games offered. This complaint also extends to the available weaponry. Dark Souls and Dark Souls II had dozens upon dozens of different weapons across roughly two dozen different weapon classes. Each class of weapon had its own characteristics, animations and gameplay style. During a single playthrough of each game, one was bound to discover many of these weapons, and miss still many more which were hidden or rare. The huge number of distinct weapons with unique characteristics made it very likely that you'd switch out your weapon at least a few times during a playthrough as you discovered new ones that worked better with your playstyle or attribute allocation. In Bloodborne, I discovered only a handful of different weapons, and none of them gave me a compelling reason to give up the weapon I'd started the game with. I'm know there are others that I have not yet discovered, but given that I finished the game and completed a number of optional areas, it's disappointing that I encountered so little in the way of unique weaponry. In general, choices and variety seem much more limited in Bloodborne. Another example of this is the covenant system; whereas Dark Souls II had maybe a dozen or so covenants, Bloodborne has only three, and they're all more or less the same. Perhaps the best example, though, are the new procedurally generated "chalice dungeons." The first few chalice dungeons you explore will be novel and exciting. They were especially so for me as a software developer, because it was interesting to think about how From Software might have gone about designing the system, which produces a good variety of layouts while doing a respectable job of maintaining the illusion that there might have been some reason or purpose in each dungeon's design. But after those first few dungeons, the experience begins to wear thin: although there are practically infinite unique layouts to explore, as far as I can tell (having tried two of the four different chalices), there's really only one tile-set. Thus, the dungeons quickly begin to feel samey and boring. There doesn't seem to be a great incentive to explore them from a story or gameplay perspective either: they are purely optional and don't appear to provide much in the way of unique loot, so what's the point? The idea with chalice dungeons, I think, was to add an extra layer of replayability to Bloodborne. But the effort seems to have backfired. The Souls games have always had very strong speedrun and PvP communities, which kept the games alive years after their original releases. I expect speedrunners will largely if not entirely ignore the chalice dungeons, as they're not mandatory, don't offer especially good loot, and being pseudo-random, can't be made part of a route or considered objectives for any competitive runs. The fact that Bloodborne is shorter overall doesn't help either. That's not to say the game is lacking in content, as it most certainly is not. But whereas it took almost a year for the world record Dark Souls II speedrun time to drop below 50 minutes, casual speedrunners are already matching that time in Bloodborne. I don't think that bodes well for the game's longevity. Similarly, while I'm not much of a Souls PvP player, I think the PvP community will be hurt by the relative dearth of weaponry and the homogenization of playstyles relative to Dark Souls II. There are clear improvements to be found as well, though. The addition of a dedicated button for healing is huge; never again will you miss a crucial heal because you're fumbling around with the item selector. This is just one of a host of changes, including new animations and a simplified armor system, designed to make combat quicker and award aggression more. Some of these changes will be positive or negative depending on your specific tastes and playstyle, but personally I love pretty much all of them. While there's an undeniable satisfaction to mastering the slower-paced, more methodical and strategic combat of the Souls games, Bloodborne's emphasis on agility distinguishes it from its predecessors even though it is actually very similar to them overall. I don't think that the Dark Souls formula was getting stale, but Bloodborne makes everything fresh again, and the value in that can't be overstated in an age of yearly franchises which continue to be churned out like clockwork, long past their primes. Finally, although I previously complained about its presumed impact on environmental variety, the fidelity with which the world was imagined and realized is remarkable to behold. This is another thing that Souls titles have always been excellent at, but in the past they were built for outdated hardware and running on underpowered game engines. Bloodborne takes advantage of newer technology to bring forth a new level of artistry. Every surface is packed with intricate detail, but not to the extent of being distracting or overwhelming; every object and building is thoughtfully designed to evoke a Gothic-Victorian horrorscape. 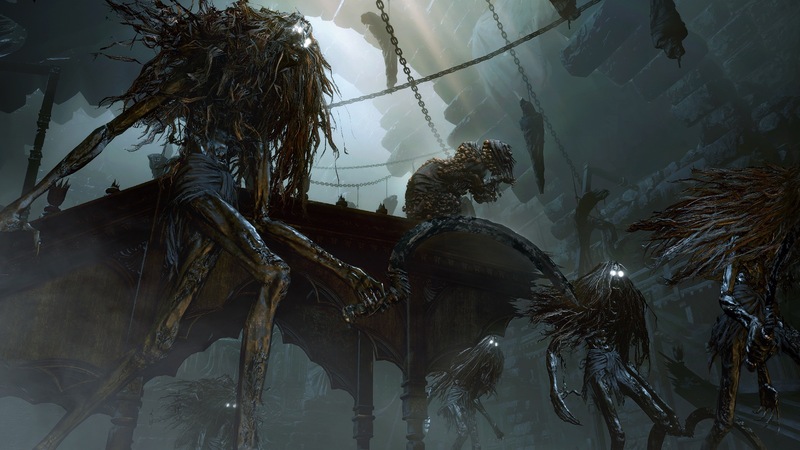 And horrifying it is: nobody does grotesque, oppressive creepiness like From Software. 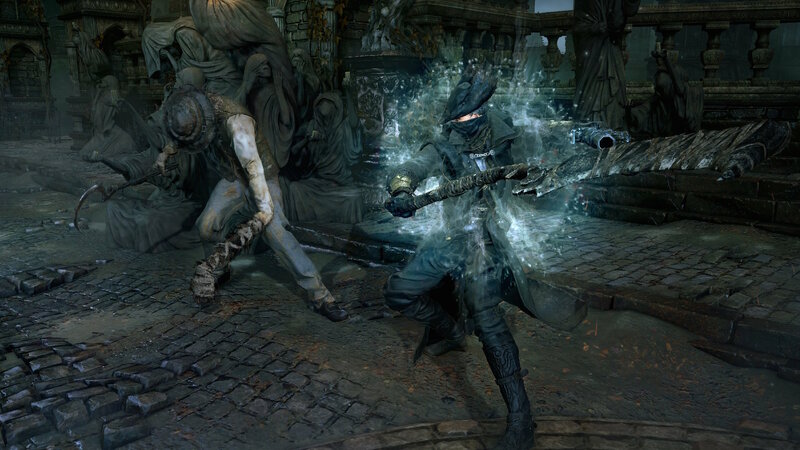 I spent a lot of text discussing the shortcomings that I feel Bloodborne has relative to its predecessors. I think those statements are reasonable and accurate; I do feel that some aspects of the game are a step backwards. Bloodborne isn't quite the follow-up to Dark Souls II that I had dreamed of. Whereas Dark Souls and Dark Souls II were damn near perfect, Bloodborne is a fine work of art, but not quite a masterpiece. But not everything has to be a masterpiece. I want to make it very clear that despite its flaws, I absolutely loved Bloodborne, and I can't wait to play through it again. It's a hell of an experience and will easily be a contender for the best game of 2015, despite how early in the year it was released. If there's one thing you should take away from this review, it's this: I spent more than $450 just to play Bloodborne, and I'd do it again in a heartbeat.